Fifty years ago tomorrow (March 23, 1968) there was an unseasonably sudden ice storm in Mansfield, Ohio. Then it snowed, which made for a treacherous beauty if you were on the highway. A good time to stay home and off the roads. However, I had to get to the church. I was getting married. It was a memorable wedding, indeed, where many relatives came from out of town but were stuck at hotels and not able to get to the wedding at all. Time for the ceremony to begin and the pastor, who lived next door to the church and I, who lived only a couple miles away, were the only people there. Dan was slipping down a small, icy grade of ice and snow saying a silent prayer that if no one but the pastor and he and I arrived we were going to get married. That stormy beginning to our half a century together could have been a red flag. Or the fact that I, a product of no faith, no father, no stable home-life, and embracing the sixties mini-skirts, bold make-up and hairdos was marrying a guy who was raised Conservative Mennonite in a home so vastly different than I ever dreamed of……Or perhaps our complete opposite personality styles should have stopped us. There were so many red flags. Our parents certainly weren’t happy about it. Any premarital counsel would have advised us to abort the idea, for sure. But Dan and I were so naive, so young, so in love. Neither of us had a plan. Or money….NONE! Neither of us had seen marriages we wanted to emulate. We didn’t know what we were doing but we learned together. We were determined to make it work. And, no, it certainly hasn’t always been rosy. We have stories to tell. But we had one solid theme…..Just Be Love. It’s Biblical. It’s just common sense. It takes effort and it works. Those three words, Just Be Love, is our middle child’s mantra that seems to be the thread that runs through our family. Back years ago all the Christians wore armbands printed with WWJD. What would Jesus do? It’s simple. Jesus would have just been love. In every situation and with every individual no matter what their race, creed, occupation or status. Yesterday Dan sent a link to our family that made all of us tear up or sob. It so embraces our family ethos and what we want for the world we inhabit. 3,000 Jews and Muslims singing in harmony, One Day. You can’t listen to this video without being moved. And each of our family members responded that they were deeply touched and were grateful to have parents who taught them to Just Be Love. It made my heart swell with joy mixed with sadness that this ethos isn’t shared by everyone. Our family has grown in numbers. The unlikely union of two very different people in 1968 produced three incredible children who never knew anything but love and who grew up to be adults who are changing the world. They have brought such diversity and enlightenment into our lives and we have all learned together what showing love means in spite of a world that thrives on violence, immorality, sensationalism and corrupt politics. None of our children’s homes have cable television. Never have. They choose to embrace love in ways that excludes filling their heads with all the hatred and inequality that casts a huge cloud over one’s outlook on life. Our children have adopted into our family several children from the Zuni Indian tribe and a handsome young man from Rwanda who used to be a street kid fighting for survival. We have a daughter-in-law whom we couldn’t love more if she were from our flesh and blood who has taught us what it was like to be a mixed-race kid in a world full of bigotry and racism. Our family continues to grow because we continue to love no matter what the circumstances. Our desire is that ONE DAY there will be no question that our world is at peace because everyone will Just Be Love. Our desire is that ONE DAY a fifty-year loving marriage will not be a rarity and children will know that Love rules the world. Happy 50th anniversary to the love of my life. You are the best thing that ever happened to me! Just beautiful, and so, so grateful to be a part of this loving family. You two have shown love and grace through all the ups and downs of finances, parenting, and this crazy thing we call life. You didn’t simply teach us to love, you WERE and ARE love – and by choosing love every day, it became ingrained in us – you impressed it on your children by example, and no matter what, we’ve always felt your love. Thanks, Momma, and happy, happy anniversary! Thanks Ashley…..Your sweet family is a testimony to love for sure. I am so proud of you all and love you fiercely. That is such a sweet note, Jeannie! Thanks so much. It has been a wild ride but I am so glad I hopped on the train all those years ago. Love you! Your family has always been love — even from those of us who have met you — and follow you all online. You are LOVE – and my mantra for the last year has been #chooselove. . . Only love can diffuse hate – -only Light can remove Darkness. You are just as the Lord calls you to be Salt and Light of the earth. . .thank you for being such great leaders. We all love you! Wow, Wendy! What a sweet message. Thank you so much. I feel very thankful and honored. You are right….hate has to be diffused by love. It’s the only way. Blessings to you! Ah thanks Babe. So many wonderful memories wrapped up in your message here. I’ve never for a moment wished I had anyone but you with whom to share these 50 years. I’m ready for the next 50! I’m not sure we will get another 50 but I am quite sure we will continue to love, learn and grow together…..with respect, kindness and joy! Thanks so much Holly! It’s be a wild ride! And continues……Blessings to you! Just read this with a warm cup of milk. Congratulations to you two! Wow, 50 years and 50 more to come. I am so proud of you and please know that I admire you both. I want my marriage and family to be like the Millers. Every time Dan shares a nugget of relationship advice I embrace it. Will never forget how you two were so welcoming in letting my crash in the Sanctuary. Promise I will do that for a young lad someday. PS: I got -48-years before I get to my 50th anniversary with my beloved Rebeca. As awkward as it may sound, the day I met my now wife Rebeca, I talked to her about my favorite podcast and mentor Dan Miller. Daniel, It is so great to hear from you. Thanks so much for reading and commenting! We started young and worked every day to “be love” with one another….I have no doubt you and Rebeca will do the same. It seems amazing to us that 50 years have passed so quickly. How did we get this old? I’m convinced God lets people live long lives so they old people can help shine a light for those much younger. I pray we do that everyday! Blessings and a big hug from Tennessee and from the Millers! What a beautiful message of a beautiful family making a big impact!! Happy anniversary Joanne and Dan! Thank you Anna for taking the time to read my blog and commenting! Blessings to you…and a big hug! I love your story and all the stories that unfold in between! You guys rock!! Go get em Dan and Joanne!! You two are such beautiful people! Thank you for teaching your loving philosophy! Thank you Judy! The best way to change the world is to do everything in love. I try……everyday! Hugs to you! Beautiful Joanne. All the best to you and Dan. Kim and I send our Love. Thank you Mike. I think of you and Kim often. Many hugs and blessings to you both! Joanne, what a beautiful story. You are amazing! I hope that I can meet you one day! What a great role model and sweet perfume are you and Dan to this world! God has raise the both of you up for such a time as this, and may He continue to keep you bonded in His love as your love grow greater for each other as the years go by. Big hugs! Happy Anniversary to you both! Tanya, I could never have predicted such an amazing life. God does have grand plans for each of us. Thank you for your kind words. Looking back over our lives, there are many things I would NOT like to go through again, but in retrospect I can see how God’s Plan fell into place. Thank you for your comment! Blessings to you and your home! 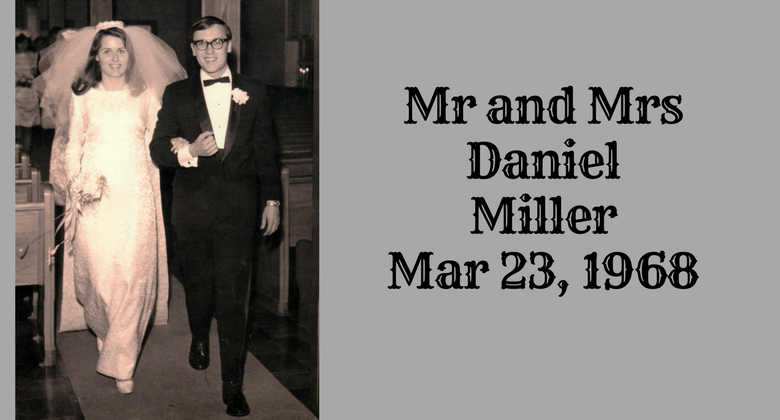 Love you and your family, and from my family to you and Dan, Happy 50th Anniversary! Thanks so much Archie! It pleases me that you take the time to read my blogs and comment! Blessings to you and Gloria! How beautifully written Joanne.The years of you and Dan have been an exciting lifetime of learning, loving, role modeling, and Godly service to many! I’m happy you have experienced this fascinating journey together and I’m blest to have had you both in my life since I was a child. You have much to be proud of as I know you have so lovingly shared your life and continually to do so. Your stalwartness of life’s hills and valleys, and your loving spirit of perseverance have made your relationship one everybody hopes for! Wow what a great message Joanne. Thanking you and your family for the continued example, love and inspiration. Congratulations to you, Dan and your whanau. Thanks, Greg! We have had quite an adventure in our 50 years! Plan to have a lot more! Blessings to you. Thank you for sharing these beautiful thoughts, Joanne. Happy Anniversary to you and Dan. You are an inspiration to us. Thanks so much Melinda. You and Terry are inspirations to all who know you and love you both! hey, JoAnne, just want to say how much I enjoy your writing style. Your words flow like silk waffling in a soft breeze. I am so happy for you and Dan and your successful marriage! This kind of commitment and success is rare these days. I pray you continue being a light shining in a dark world for all to see, so love…in Jesus, the epitome of love, will continue to prevail! What a sweet note, Jemie Lu. Thank you so much for commenting. As you know, a successful relationship requires daily work and commitment. It doesn’t just happen to the “right folk”! We all have that opportunity. The question is, what do we do with it? It takes effort. I pray we are always a shining example….but that sure doesn’t mean it is always easy! Bless you!